IKAYAA child study set is designed to provide a more comfortable learning environment for children. Both desk and chair are height adjustable to suit the growth of your child. And table top is 0-40°tiltable for writing, drawing etc. Made of high quality metal and plastic, it is stable and durable for long use. Sliding-out drawer, hanging cup, hook, groove to storage stationery and schoolbag etc. 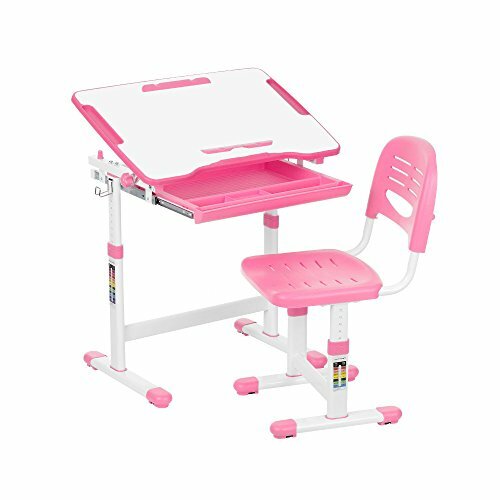 Good study set your child cannot miss specifications: Material: Metal + plastic + mdf color: Pink / blue / grey (optional) table size: 66 * 46.5 * 54-76cm / 25.98 * 18.31 * 21.26-29.92in (w * d * h) chair size: 35.5 * 37 * 32-44cm / 13.97 * 14.56 * 12.6-17.32in (w * d * h) product weight: 16kg / 35.3lb package size: 73.5 * 53.5 * 21cm package weight: 17.7kg / 39.0lb package included: 1 * table 1 * chair 1 * roll of paper. Tiltable table top: 0-40°tiltable(with stopper to protect fingers), adjusted for writing, drawing etc. If you have any questions about this product by IKAYAA, contact us by completing and submitting the form below. If you are looking for a specif part number, please include it with your message.